Theology of the Body speaks often about mystery. One young actress in Hollywood has spoken out and makes the quote of the week. Who? 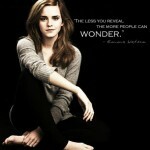 Give a hand to Ms. Emma Watson. While I cannot comment on any of her other views nor the manner in which Ms. Watson lives, she intuitively understands what society does not. Ms. Watson understands that in order for the public to see and hear her, she must wear more than less. It’s counter-cultural. It’s radical. It’s TOB! I love the fact that she (consciously or unconsciously) wants to make people think and be “in wonder” or awe at the mystery of who she is. Her comment betrays a desire to be seen and heard. Isn’t that what we all desire?